Parma is best known for two things, Parma ham and Parmigiano-Reggiano! 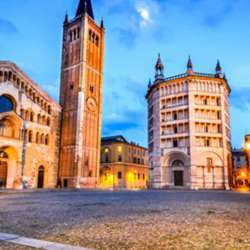 But with its colorful buildings and historic architecture, Parma is also a very fascinating city. It is the perfect size for a day trip and there are many things to do: visit the Duomo and the Baptistery, take a look inside the beautiful Biblioteca Palatina, take a walk in the Ducal Park, look at classical art in one of the galleries or simply wander through the historic center among the hidden boutiques and small delis in the backstreets. That will surely make us hungry and will lead us to have a meal in a traditional trattoria. Furthermore, for those interested, there is the possibility to visit the TRAVEL OUTDOOR FEST Protected content . The ticket price is € 5 and the opening hours are from 9.30am to 6.30pm.